VALIADIS & Co. Ltd., was founded on year 1927 from Valiadis Bros., who built the first factory in Greece for the manufacturing of electric motors.It constitutes as a company the oldest one in its objective in the Greek area, playing always a leading role, since when was founded, till nowadays on the specific branch of the Greek and Balkan market. During the first years of the enterprise operation, is included in its activities, the manufacturing and repairs of direct current motors.Later on, is extending its manufacturing activity and to alternating current generators. 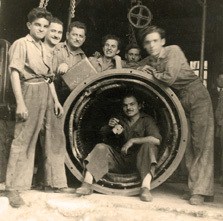 After the Second World War and the establishment of alternating current, starts the manufacturing of induction motors, slip ring and squirrel cage ones after special order. On year 1949, undertakes, manufactures, and delivers to the Water Company electric motors of 850 HP. 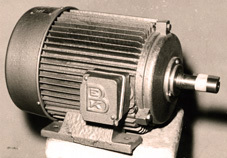 On year 1956 starts the production of watertight motors. Since year 1965, started manufacturing motors according international standards, in particular the recommended by IEC norms. Same year starts the manufacturing of pumping units, and in particular the Monoblocks. On year 1966, expands the motor power limits, reaching 430 HP on standard products range. On year 1975, starts production of the Ex series explosion proof motors. On year 1979, establishes the aluminum frame to all motors production till 7.5 kW, preserving in parallel the cast iron frame. 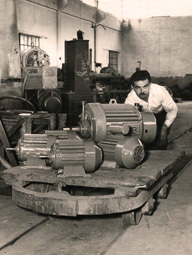 Οn year 1980, the design department starts study in designing and manufacturing hollow shaft motors. These motors are getting started in production same year. On year 1994, is developed by the Company a device for motors to a special design, which is an own construction of the Company. Speed regulation, (voltage regulation with Triacs) especially for motors with centrifugal loading (pumps, fans etc.). This device is in production since year 1996. On year 1995 starts disributing to the Greek market Inverters. On same year our Company finances a duration of 3 years research program for the development of AC inverters design. With this program our Company finances also a Ph.D. study on advanced vector control of AC motors. On year 1996 our company is being certified with ISO-9002 (Certification No 9605292)for construction, distribution and repair of electric motors. Since year 1997 all our products are verified with CE. On year 1997 our company upgrades the quality certification from ISO 9002 to ISO 9001 by RW TUV. On year 1997 we start distributing Explosion Proof motors with certification (EEx-d) from the Italian Institute CESI. On year 2000 is developed by the company electric motors that operate in 10.000 RPM, special construction together with inverter. These motors are used in cutting and drilling machines. On year 2002 the Explosion Proof motors get also the ATEX certification. The main structure of the Company is consisted, of the main manufacturing section for standard and special asynchronous motors, the section for the repair and maintenance of any type and kind of motors, the test and quality control section, and the research and development section as well. The manufacturing program of our factory includes also except the 3phase squirrel cage motors, slip ring motors also, single phase motors, motors with brake, double speed motors, Ex motors, hollow shaft motors, reduction gear motors, and high and low pressure pumping units. We can also supply to our customers, High Voltage motors, and DC motors being in collaboration with a European factory. Finally in our factory, our repair unit undertakes repairs of High and Low voltage motors, direct current motors etc. We have already repaired and are in perfect operating condition HV motors of many companies.